Fall is an important time for home maintenance as property owners get their homes in shape before the harsh conditions of winter arrive. Here are some fall maintenance tasks that can make sure your home is warm and ready when cold weather comes. With cooler weather, children back in school and the beautiful colors of nature, fall is a favorite time of year for many. It’s also an important time for home maintenance as property owners get their homes in shape before harsh winter conditions arrive. Some people like to tackle home improvement projects themselves, while others would rather leave the maintenance to the professionals. Whatever camp you’re in, here are some fall maintenance tasks that can make sure your home is warm and ready when cold weather comes. Damaged walkways, driveways and steps can be serious safety hazards. The dangers are compounded when icy weather arrives, notes Better Home & Gardens. Fixing damaged concrete and pavement in the fall can prevent little problems from becoming expensive headaches next year. Fill cracks with crack repair material you can find at a home improvement store. Pay attention to uneven sections and loose railings on steps. Most small jobs are relatively simple for do-it-yourself projects. If you have more significant issues like replacing a section of sidewalk or driveway, call in an expert to make sure the repair is handled correctly. Exterior doors should have seals on all four sides to prevent outside air from infiltrating your home. Over time, the seals tend to turn brittle and crack. Inspect yours to check their condition. If they are dried and cracking, replace them. If your door is missing seals or you can’t find the proper replacement, most home improvement stores have foam weather stripping you can use instead. Just peel off the backing and apply it along the inside of the door frame. Don’t forget about the garage door. Quality air seals can help keep your garage warmer and lower your energy bills. At most homes, the garage door opens and closes many times each day so it is important that it functions properly. If the door needs maintenance or if you want a new look or an insulated garage door, contact a garage door expert to explain your options. Clearing rain gutters and downspouts is one of the most important fall chores, but wait to do it until after all the leaves have fallen. Clogged gutters are a primary cause of ice dams, which can lead to serious water damage inside your home. After cleaning, bobvila.com recommends flushing gutters with water and inspecting joints and seams where gutters connect. Fix leaks with caulk and tighten any loose brackets. You want to make certain the gutters are attached firmly to your house. If gutters are damaged, consider replacing them with new ones that have built-in leaf guards. Inspect your home’s roof for missing or loose shingles. The roof is your first defense in protecting your home. It’s better to proactively deal with repairs in the fall than to discover a leaky roof after a heavy winter snowstorm. 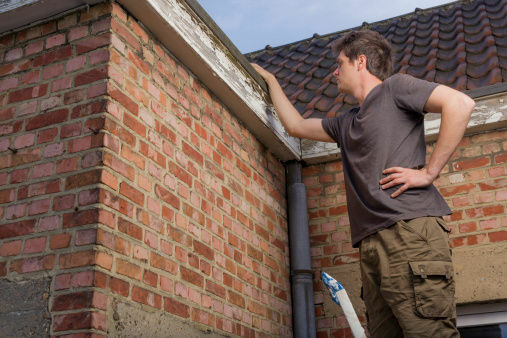 Inspect anyplace where metal flashing connects with the roof and apply sealant if there are any openings or gaps. Most homeowners know to change their furnace filters every fall and to have their furnaces serviced regularly. At the same time, many neglect their home’s smoke detectors. In 2015, there were 365,000 house fires in the U.S., according to the National Fire Protection Association. Those fires killed 2,650 people and injured more than 11,000. The damage totaled more than $7 billion. Home fires are more prevalent in winter. Faulty furnaces, space heaters, candles, stoves and fireplaces all contribute to house fires. In fall, you should check all your small and large heating appliances to make certain they are working properly. Also, check your smoke detectors and replace batteries, if needed. Your home is a major investment. You can protect that asset by making sure your house is ready before cold weather arrives. Whether you do the work yourself or call in an expert for help and advice, a little effort now can pay big dividends later.